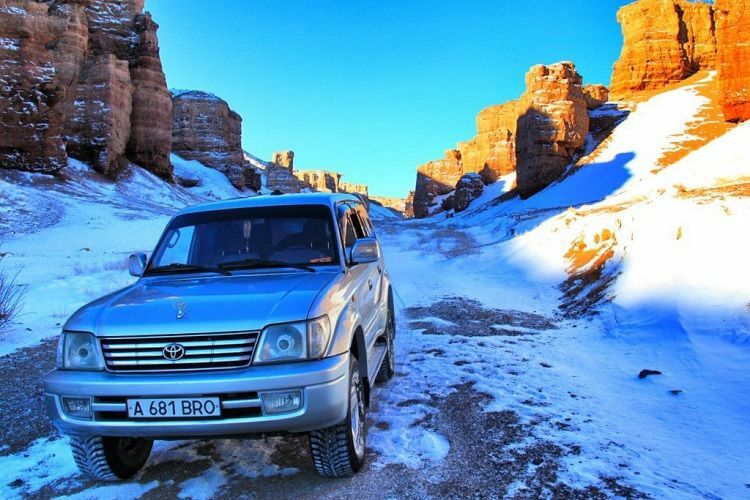 Outfitter KZ team is pleased to offer an one-day SUV tour with trekking elements in the canyon of the Charyn river. 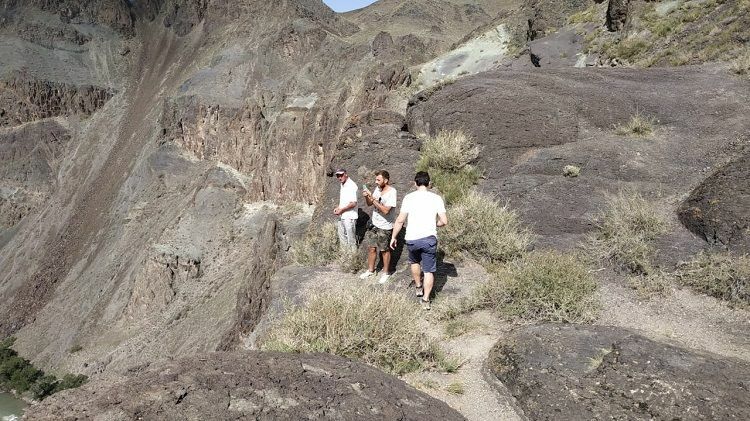 Our tour is the most intensive trip to canyons. 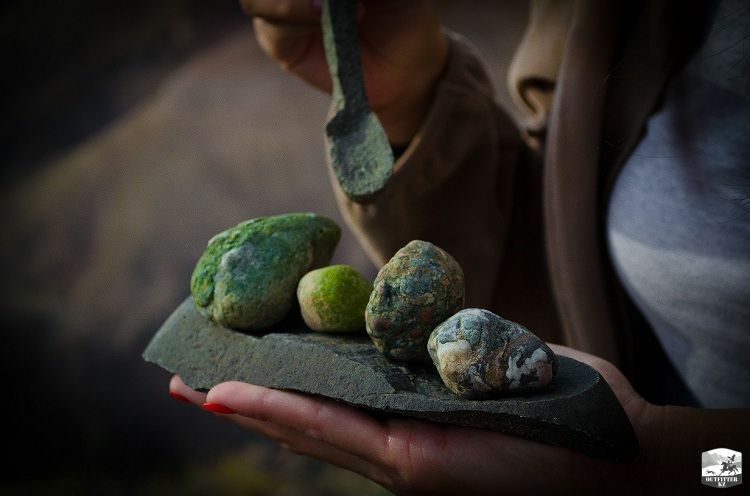 You may compare itineraries of local guides, 99% of tourists visits only the Valley of the Castles. We visit six locations inside canyons during a trip. 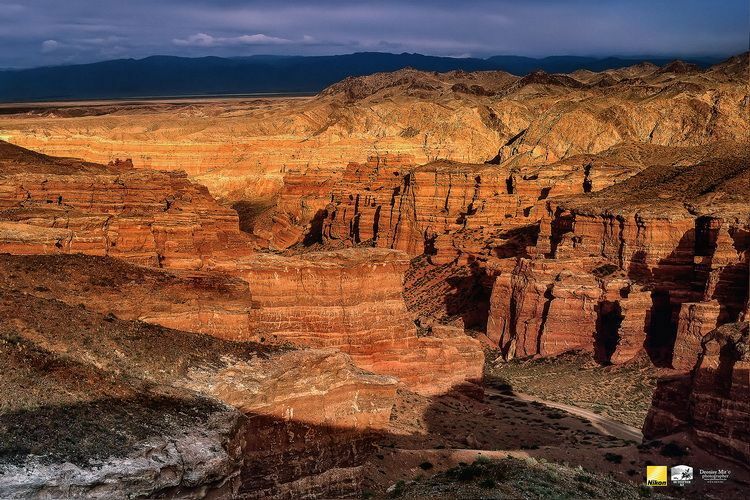 The canyon of The Charyn river is located in Raiymbek district of Almaty oblast in 200 km distance from Almaty. The canyon is more than 100 km. 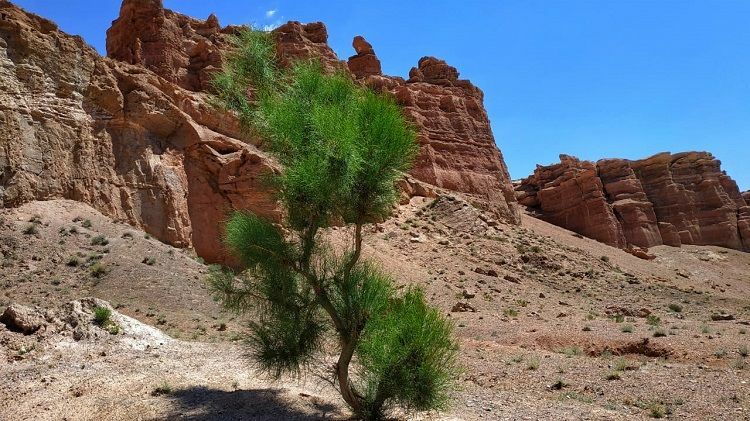 There is a different varieties of relict trees in it, such as Sogdian ash-tree, a survivor of the Ice Age, and turanga. The route is designed for year-round visits (free of dirt, long duration of the warm season). The most comfortable months for tourists are April / May and September / October. At the same time the snow canyons also have their own unique appeal. We collect participants from a single point, which is convenient for customers. Why is it so early? It allows maximum coverage of both canyons and the viewing platforms. 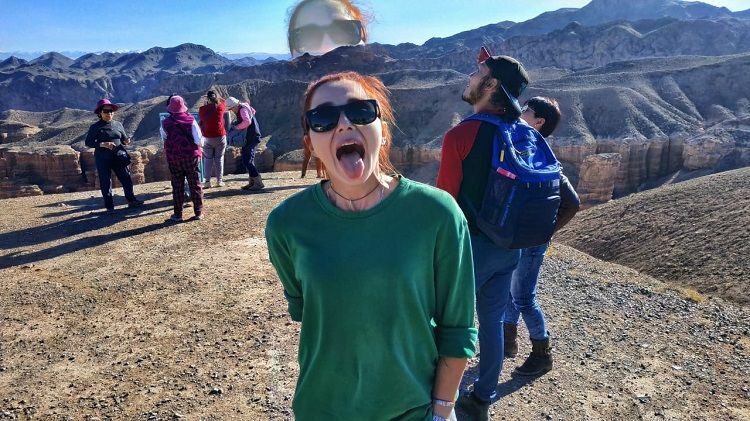 Regular bus tour includes a visit to A Valley of Castles only, whereas our Jeep tour has at least four more places that capture your imagination in the canyons. Also, the heat kicks in after 11 am in the canyons, so you need to go through the Valley of Castles at least while it is still cool. We return to Almaty by 19:00. The road to canyons lies along the picturesque road along agriculture fields, pastures for animals. 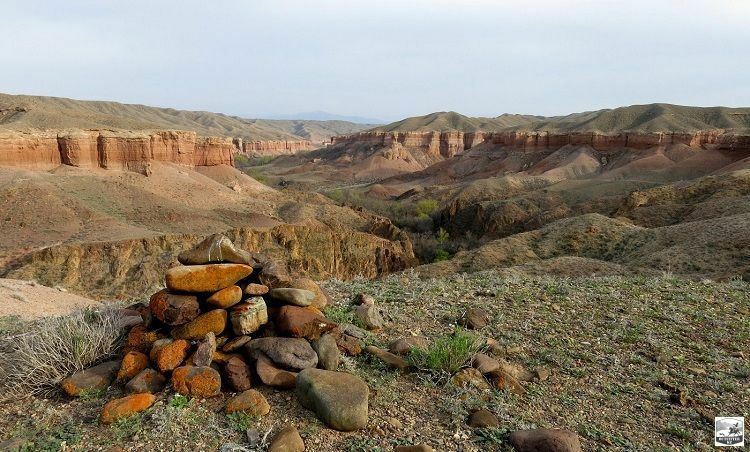 The guide-driver tells the story of the creation of Almaty region, there are some short stops for photographing of the foothills. We leave the cars in the parking lot at the descent into the canyon valley of castles. Having taken the drinking water, we walk down into the gorge. It is a leisurely trek with some stops (50 minutes) to the EcoPark village (2 km one way). 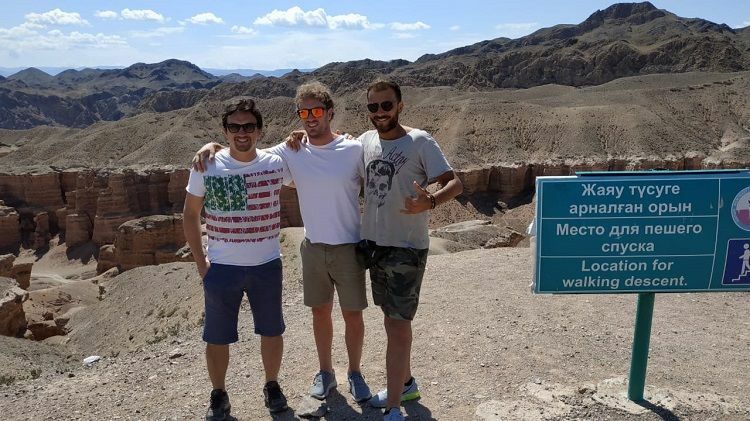 The guide tells you about the differences of Charyn canyon. 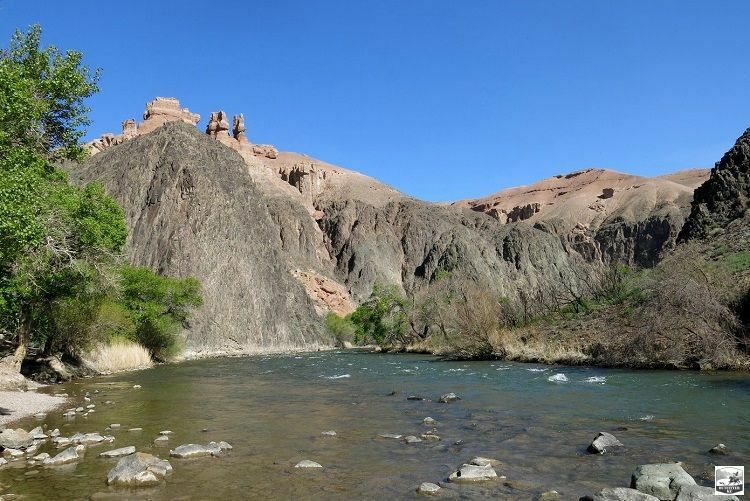 A short stop (15 minutes) at the Charyn river is in the shade of trees, you can photograph there and then we return to the cars (1 hour since it is uphill). 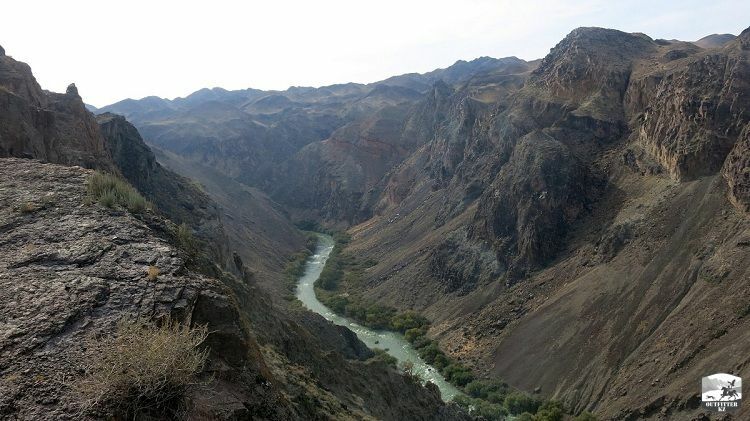 Ten-minutes break beside the cars and then leaving towards left bank of the Charyn river. After 30 minutes of ride there is a stop at the panoramic view on the Lunar Canyon. A photo shoot for 15 minutes and leaving in the direction of the panoramic area # 4. The stone shelf is a unique place in the Sharyn Gorge. The majestic view suddenly opens to visitors, capturing the spirit. Visitors should observe precautions when visiting a stone shelf, the height of the wall reaches 250 meters. 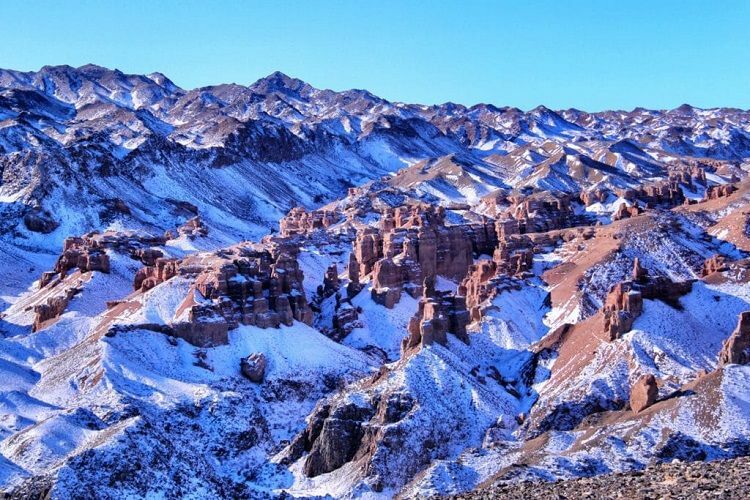 The landscape of the stone shelf resembles the landscapes of mountain belts, which are located at an altitude of 3 500 meters, but in fact tourists are at an altitude of 900 meters above sea level. The next place to visit in Sharyn canyon is called "Napoleon". 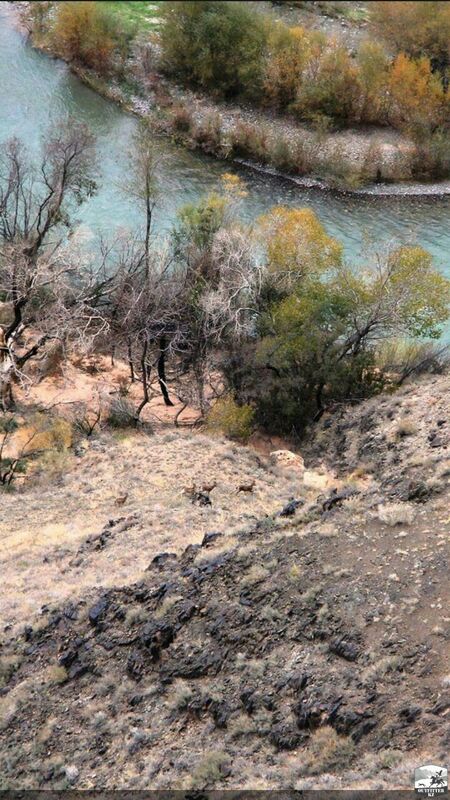 In fact, we go around the Sharyn River and return to the first location, where you can see the valley of the castles from the right bank of the Sharyn River. Scale landscape, castles of the red canyon in the form of Greek amphitheatres will remain forever in the memory of tourists. After 30 minutes ride there is a stop at the site. There is a view on the Valley of Castles. Photo shoot for 15 minutes, going to the last location of the route - the Austrian spot. Way back to Almaty. 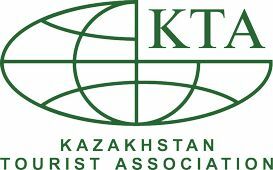 39 USD per person in a group of 5 without English-speaking guide (Toyota Sequoia SUV), total 195 USD. 55 USD per person in a group of 4, total 220 USD (46 USD without English-speaking guide). 67 USD per person in a group of 3, total 200 USD (53 USD without English-speaking guide). 95 USD per person in a group of 2, total 190 USD (80 USD without English-speaking guide). 185 USD for an individual tour (155 USD without English-speaking guide). Precautions: a mandatory sun hat, sunglasses, anti-bug repellents (spring period). 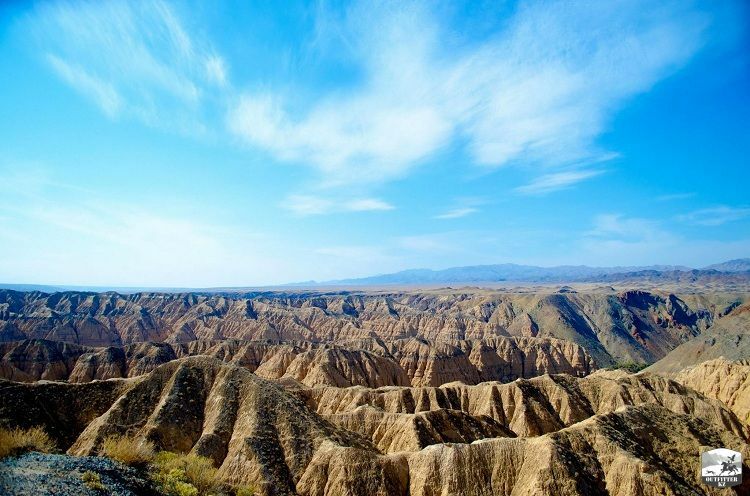 The total route length is 520 km by car and 6 km of trekking. What'sApp is available also on +77086237951 (Malika). 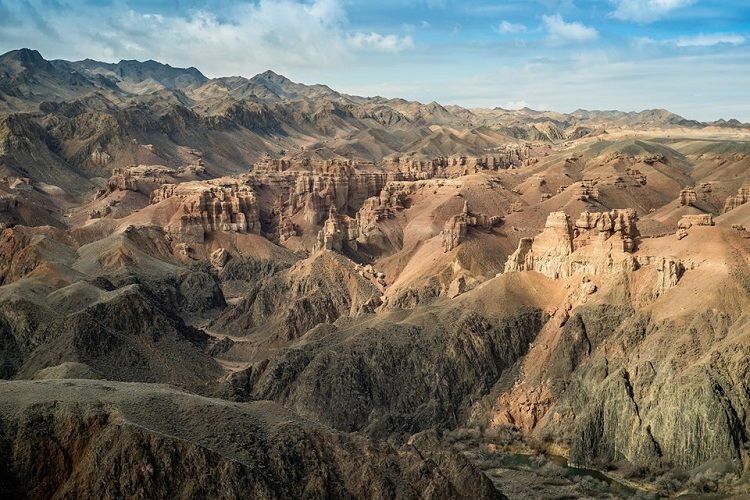 The detailed review by Nathan Cooper about trip to Charyn with us. 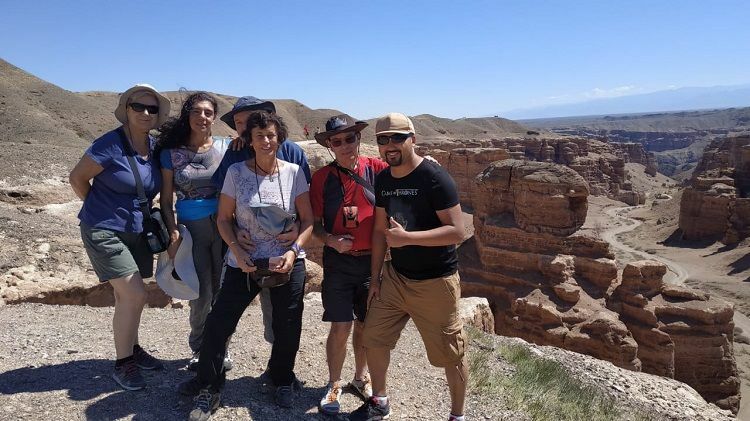 Charyn canyon, Sharyn canyon, Zhabyr canyon, Lunar canyon, Rayimbek district, Charyn river, tour to Charyn, Choundzha, Sogety, Zhalanash, Ulken Buguty, Bala Buguty, Kokpek, Toraigyr, Baiseit, Shelek, Chilik, Ile Alatau, Ile river.